Hi Matt, could you save a spot for me cheers! How do we go about getting passes for the show? What time at The Swan Inn, WA16 6RD? I'll be in Edinburgh this weekend. Have a good show guys! I'm pretty sure I can come to this - count me in! really sorry _ i'm not going to make it. Don't wait for me. Lost power climbing a hill after a straw lorry sheds lots of loose straw bits and dust in front of me. 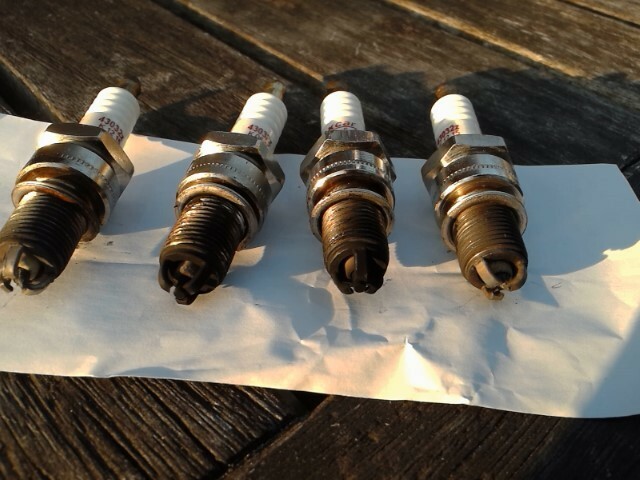 Sparkplugs should not look like this. Maybe it was the altitude. with breakdown truck behind, and sounded like 3 or only 2 cylinders working. guys and girls thank you to everyone that showed sorry to those that had to miss but what a fantastic day and a fab range of cars and some really nice people, thanks to everyone who came and said hello now I'm off to put some after sun on as I'm quite red now. It's running again. I reckon plugs were too hot heat range. I don't think there's any major damage.